Extracts from this publication may be freely reproduced with acknowledgement of the source, provided the parts reproduced are not distributed for profit. SAT is a project of the Canadian International Development Agency delivered by the Canadian Public Health Association. It has been at the forefront in supporting the community response to HIV and AIDS in southern Africa since 1991. School Without Walls is an initiative of SAT to validate, promote and diffuse the unique southern African experience and expertise in responding to HIV and AIDS. SAT is profoundly grateful to the volunteers and professionals who have made this publication possible and who are supporting SAT in the preparation of future publications. Introduction Aim and audience Working on HIV and AIDS is not easy, especially for people working on the frontline of the epidemic in community groups and NGOs that provide information, give emotional support and care for the sick. It is particularly difficult for staff and volunteers who also are infected with HIV or affected by HIV and AIDS. In these situations, workers and carers are likely to feel the stress or pressures of their jobs, responsibilities or health status. Stress is a response to things in a persons life that cause him or her anxiety. People respond to stress in a variety of ways. Regardless of the response, however, being stressed does not need to be a permanent condition. This booklet aims to show that individuals can manage their stress by recognising the signs, identifying the causes and finding practical ways to take action and get support. The main audience for this booklet is HIV and AIDS service providers. Service providers are staff and volunteers  including carers, office personnel and counsellors  working on HIV and AIDS in community groups and NGOs. These guidelines can help them manage their own stress and support their colleagues. The booklet will also be useful for people who receive HIV and AIDS services. These include people living with HIV and AIDS, family members and friends. Again, it can help them manage their own stress and give support to others. Important terms Affected by HIV and AIDS means experiencing psychological, social or economic problems because a spouse, family member or close friend is living with HIV and AIDS or has died from AIDS. Client refers to a person receiving counselling or other types of services. Confidentiality means that information shared is not revealed to anybody else. Confidentiality is essential in the relationship between service provider and client. At times, a service provider may find it useful to reveal confidential information to another professional. This requires the expressed consent of the client. Counsellor refers to a person providing counselling services. This may be a professional, accredited counsellor or a person who has developed skills and experience in helping people through their difficulties. Infected with HIV means carrying the Human Immunodeficiency Virus in your body. A person testing positive from an HIV test is referred to as being HIV positive or living with HIV. NGO refers to non governmental organisation. Personal inventory of stressors is a list of the specific things that make a person feel anxious, angry, etc. Rules for survival are an agreement that people make with themselves to help them manage their stress. They are the minimum dos and donts for looking after themselves. Service provider is someone who provides a service  such as care or counselling  to a client. In this case, it refers to staff and volunteers of community groups and NGOs working on HIV and AIDS. Stress is a mental, physical and/or behavioural response to things in peoples lives that cause them anxiety. Stressor refers to something that causes a person stress. Definition of stress People define stress in different ways. Generally speaking, it is a mental, physical, and/or behavioural response to things in peoples lives that cause them anxiety, worry or tension. We all have to juggle different needs and pressures at home and work. It is part of what makes life interesting and exciting! Sometimes those needs and pressures seem too many, too big or too complicated. That is when we might feel stressed. People may feel stressed because of one thing. For example, a homebased care provider might feel stressed because of the large number of clients to take care of. More often, it is because of several problems. For example, that same person might be stressed because he or she is also responsible for taking care of orphans at home. Stress can be particularly severe for people who are infected with HIV or affected by HIV and AIDS. They face extra personal, physical, psychological and/or financial pressures, such as stigma and high medical bills. Stress can be conscious or unconscious. A person might or might not be aware of it. Stress can be a positive experience, however, pushing people to get things done. But it can also be negative, causing people distress and making them unwilling or unable to take part in everyday life. Step 1: Recognising the signs and symptoms of stress The many different signs and symptoms of stress vary from person to person. The signs can be categorised into two types: social and mental and physical. Stages of stress Individuals often have a pattern to their signs and symptoms of stress. For example, someone may tend to have one reaction (such as stomach upsets) rather than another (such as high blood pressure). Within a family, individuals may also show different patterns to their responses to stress. Stress often starts with small signs and symptoms. For example, a person might be just a bit more tired and forgetful than usual. These symptoms can easily  and sometimes quickly  progress to severe ones. For example, the person might become aggressive and have high blood pressure. If stress is managed early and well, it can help you learn and develop, personally and professionally. For example, learning that you are HIV positive might be very upsetting at first, but with good support from the start, you can learn to plan your life more carefully. If stress is not managed early or well, however, it can have long-term, harmful effects on your mind and body. Facing the problem Being in denial about stress can be harmful and make the problem last longer and become more serious. It is vital to face the reality and to admit to the problem as soon as it appears. You can recognise the signs and symptoms of stress by:  Being aware of the full range of possible signs and symptoms  Noticing changes in physical health and body language  Noticing changes in attitudes and behaviour. Although friends and colleagues can make you aware of signs of stress, you need to be able to identify when you are stressed. Being honest with yourself is a key part of managing stress. Step 2: Identifying the causes of stress Types of causes Once you have recognised the signs and symptoms of stress, you need to identify the stressors. Stressors are the things that cause you stress and that you need to address in the present and prevent in the future. A variety of things in a persons life can cause stress. Some might be related to working on HIV and AIDS or being infected with HIV or affected by HIV and AIDS. Others might not. Stressors can be divided into four types: physical, social and personal, financial and professional. Examples of these types of stressors are shown in the table on page 10. How to identify the causes It is important to recognise that someone is experiencing stress and to identify why. In practice, it might be too confrontational to ask yourself or a colleague blunt questions such as, Why are you so stressed?, or to make blunt remarks such as, Youre looking very stressed today. Instead, it may be better to approach the subject gently. You can do this by asking general, open-ended questions about how you are feeling, emotionally and physically. For example:  What sorts of things are annoying me now?  In what way am I feeling angry right now?  Why do I feel worried at present? Anger me Distract me Depress me Worry me Wear me out Bore me · Think about what this personal inventory of stressors tells you. For example: Are there a few or a lot of things that stress you? Is it home things, work things or both that stress you? Root causes and contributing causes Once you have identified the stressors in your life, it is helpful to identify the root causes and contributing causes.  Root causes are the most important ones and the main source of a persons stress. They need to be addressed urgently  Contributing causes are the less important ones that influence and add to the root causes. They might not need to be addressed so urgently. Whether you are looking at your own stress or that of a colleague, approach this area sensitively. The root cause might be something very personal, such as sexual abuse. If such an issue is confronted too early, you might become unwilling to talk and your level of stress might increase rather than decrease. Treating people as individuals The causes of stress  like the signs and symptoms  are influenced by each persons:  Individual characteristics  Physical well-being, including HIV status  Upbringing and family background  Cultural and/or religious beliefs  Expectations of themselves and others  Systems of personal and professional support. These influence why people experience stress, how they react to it and what steps they need to take to manage it. Therefore, it is always important to treat everyone as individuals and to find out exactly what stress means to them. Testimony 1: Noticing changes Mary had worked with Tendai in the community outreach team of an AIDS Service Organisation for four years. Although their work was hard and emotional, they had always enjoyed each others company and had fun. In the past month, however, Mary had noticed changes in Tendai. At first, he just seemed a bit absent-minded and frustrated. However, he gradually became more bad tempered, even shouting at a client. He seemed to be very tired and to have many headaches. Mary was nervous about approaching Tendai, as she didnt want to interfere. However, she cared very much about her colleague. One day, while they were having tea together, she asked him how things were going in his life. At first, Tendai was angry with Mary and did not want to talk. He just gave brief answers, muttering about being exhausted by their work because more and more people were dying and they could offer little help. However, when he realised that Mary genuinely cared, he began to open up. Gradually, he revealed that the root cause of his problem was that his brother had died six weeks ago, leaving four orphans in his care. Alongside his own three children, they needed love, food and school uniforms  which he was struggling to provide with such a demanding job and low wage. Mary encouraged Tendai to talk more about his current situation. She reassured him that she understood his worries and wanted to help. They decided that they would talk more the next day. They also decided that they would work as a team to find practical things to do, both at home and at work, to reduce Tendais level of stress. Step 3: Taking action on stress Practical actions Once you have recognised the signs and identified the causes, your next step is to develop solutions to stress. This involves identifying positive and practical actions to help you relax and feel in control, whether at home or at work. Share your problems. Find people with whom you feel secure and tell them about your worries. Do something about the problem. For example, take an HIV test rather than just worrying about being positive. Avoid making too many big changes at once. For example, if you are getting married, dont also start a new job. Take care of your health. For example, eat nutritious food, get enough sleep, take exercise and avoid alcohol. Say no and set boundaries. For example, tell members of your extended family that you cannot look after more orphans.  If Im having a hard day at home, what helps me relax?  If Im under pressure at work, what makes me smile?  What makes the difference between me feeling happy and sad?  What makes the difference between me feeling in or out of control? Find a quiet place. Stand with your legs apart and both feet firmly on the ground. Relax your shoulders. Clear your mind of thoughts and concentrate on your breathing. Breathe in slowly and deeply. Hold your breath for four seconds. Breathe out slowly and deeply. Wait for four seconds.  Praying or meditating  Doing breathing exercises  Celebrating a success. Rules for survival Once you have identified practical ways to fight stress, you can use them as the basis of your rules for survival. These rules are an agreement you make with yourself. They are the minimum dos and donts for looking after yourself and managing your stress.  What are the two or three things that I must do every day at home or at work to stay happy and well? At home, your rules for survival might include:  Asking my children for help when I need it  Finding time to listen to my favourite radio programme  Taking a short walk on my own every day. At work, they might include:  Delegating whenever I can  Saying no to things that are not my responsibility  Telling my supervisor when I am overloaded. To develop effective rules for survival, get to know yourself well. Find out what makes you stressed, how much stress you can take and what makes you feel better. Not enough hours in the day? • Think about a typical day in your life and what you do during different typical hours (e.g. first thing in the morning or at lunchtime). • Assess how much time of each day you give to different parts of your life (e.g. home and work) and when you feel stressed. • Identify practical ways to manage your time better. For example, if you feel you do not spend enough time with your children, you might decide to arrive at work 30 minutes earlier in the morning and leave 30 minutes earlier in the afternoon  so you can be with your children after school.  Being systematic  writing lists and keeping records of what you have done and how long it took  Getting support. For example, asking colleagues to leave you alone for an hour if you have a task to complete. Testimony 2: Stating your case John is a finance officer at Communities Fighting AIDS (CFA). Recently, the two other finance officers had died, probably due to AIDS, although no one said so. They had been replaced by trainees. This meant that John had to teach his new colleagues while also doing his own work. Also, the Director of CFA kept asking him to do extra hours and to take on more responsibility. Meanwhile, John faced pressures at home, being responsible for a wife and child, both of whom were ill. After a very hard week, when he worked 10 extra hours, John decided to stand up for himself. With the help of his wife, he identified the key points that he wanted to make to his Director. These were that: he should not have to do work that was not in his job description; he should be paid for extra hours worked; and HIV and AIDS should be talked about more honestly within the organisation. He rehearsed his speech, with his wife playing the part of the Director, so that he He sat calmly, made eye could practice talking slowly contact and used his key and using positive body points to communicate his language. needs Back at work, John asked the Director for a meeting. He sat calmly, made eye contact and used his key points to communicate his needs. The Director admitted that he, too, felt overwhelmed and was grateful for such a reliable employee. He agreed that John should only perform the hours and duties in his job description and that there should be a staff retreat to discuss the personal affects of HIV and AIDS on staff and volunteers at CFA. After the meeting, John felt very relieved. He also felt proud of himself for having stated his case and standing up for his rights. Linking needs to systems You should be able to link your needs with the available support systems (see box). Where possible, it is best for you to act for yourself. However, others can help. For example, a colleague or a counsellor can provide contact details for organisations or make appointments for you. Linking support needs to support systems To make the most of the support systems available to you, it helps to: 1. Identify what type of support you need to address the root causes of your stress. For example, do you need emotional, practical and/or financial support? Testimony 3: Finding my support system My name is Memory and I am 14 years old. I have a mother and two brothers. I have been a peer educator at my schools AntiAIDS Club for a year. Three months ago, my mother became bed-ridden. After that, I had to do everything in our home, including bathing my mother and doing the cooking. We had to depend on food given by neighbours. It was hard to find time for peer education. It all felt too much and I began to feel very anxious. At times, I would just sit in a corner and cry. At my supervision session with John, the Youth Worker for the NGO that runs the Anti-AIDS Club, he noticed that I was upset and asked what was wrong. I told him about my problems. He was sympathetic and said that I did not need to feel alone. We discussed how to reduce my hours with the Anti-AIDS Club and identified support systems available to me. John referred me to the NGOs home-based care team and told me about a self-help group for young people affected by HIV and AIDS. Now, I do one peer education session a week and go to the self-help group  where I share my problems with others in a similar position. Also, our family gets regular visits from the home- based care team who wash my mother and bring us mealie meal. I still worry about things, but now I feel much more in control of my life and know that there are people out there to support me. Knowing what to avoid Try not to: • Get personally involved with clients • Say yes to everything clients and colleagues ask • Work alone too much of the time.  Using the unofficial support systems available to you, including moral support from colleagues  Delegating tasks whenever possible  Being creative in your work, rather than doing the same thing day in, day out  Complaining in a way that is constructive and that helps to solve problems rather than make them worse  Making time for small, boring jobs  so that you get them done and have more time for what you enjoy  Finding a quiet place and using it every day  Learning to say I choose to do this rather than I ought to do this  Giving praise to yourself and others for work well done.  An atmosphere of listening and openness, with opportunities to resolve conflicts and share concerns, including about HIV and AIDS. These might include staff meetings, workers committees and suggestion boxes (where staff can put their ideas anonymously)  Participative processes for planning that enables everyone to give input into the direction of the organisation, including what type and level of work is possible  A culture of learning from successes and failures, rather than one of blaming. This might involve holding de-briefing sessions, documenting lessons learned and celebrating achievements  A sustainability plan that helps people feel secure about the organisations long-term future. This might outline plans to broaden the funding base and raise more resources from local sources  A compassionate approach. This means putting people first. It varies from small things (such as providing somewhere for people to make tea) to big things (such as welcoming a recently widowed employee back to work and helping her get back on her feet). Establishing helping relationships with clients Having conversations that have a purpose Listening attentively to clients Helping clients tell their story Giving clients correct and appropriate information Helping clients make informed decisions Helping clients recognise and build on their strengths Helping clients develop a positive attitude to life. Creating a welcoming environment Create a supportive environment for counselling a stressed client. If sessions are not confidential, or if you seem to be in a hurry, the client might become more rather than less anxious. Using creative methods and language Using a variety of methods can help clients fully express their anxiety. These methods should focus on asking questions that encourage clients to say how stress makes them feel. However, it can also help to use methods  such as role-play  that help clients show how it makes them feel. The language that you use is also important. For example, people might not know or like the term stress and might prefer to talk about being anxious, overloaded or unable to cope. You should avoid giving clients labels that make them feel uncomfortable. Self-awareness Your own experiences and characteristics  including your own HIV status, culture and religion  will affect how you react to a client. Understanding your own motives for It is vital to be non working with people experiencing judgemental at all stress is an important part of knowing times yourself  which makes it easier to be honest and straightforward with your clients. Be aware of how your opinions, prejudices and fears  including about HIV infection  can affect your work. It is also vital to be non judgemental at all times. For example, what might seem like a small problem to you might be causing the person in question severe distress. Support for counsellors Working with stressed people can be very stressful. This is particularly the case when working on HIV and AIDS and dealing with traumatic situations, including death and dying. You need to be able to identify your own signs and causes of stress and to act. 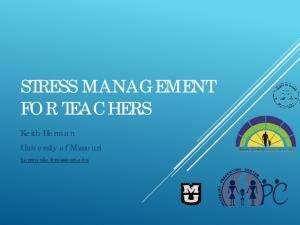 Report "Counselling Guidelines on Stress Management"